Gingivitis is the medical term for inflammation of the gums (gingiva), which is a mild form of gum disease, usually caused by a bacterial infection as a result of plaque formation. Gingivitis is both preventable and treatable. However, without the appropriate measures to prevent complications by treating the disease at the earliest possible stage, gingivitis can quickly progress to cause significant damage to the teeth, gums and mouth cavity as a whole. Gingivitis may be of two types, depending upon the severity of the condition. Chronic gingivitis is the more common type of gingivitis and is closely linked to inadequate oral hygiene. In most cases, a person is unaware that they have chronic gingivitis and do not seek medical treatment until the symptoms become pronounced. Slight bleeding and mild swelling of the gums are the first signs and symptoms. If attended to in the early stages, gingivitis may be totally reversible with simple measures such as brushing, flossing and cleaning. The other form of gingivitis is known as acute necrotizing ulcerative gingivitis (ANUG), Vincent’s stomatitis, or trench mouth. It is rarely seen these days. ANUG is more likely to develop in a person with an impaired immune system or in those with severe malnutrition. This is a more acute and invasive form of gingivitis which may cause foul-smelling breath (halitosis), fever and painful gums in addition to other symptoms. ANUG may develop in people with a history of gingivitis who experience a stressful event and is more common in smokers than in non-smokers. 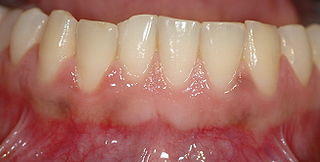 Gingivitis is most commonly caused by long-term effects of plaque deposition, usually due to inadequate oral hygiene. Gum injury due to any cause. This may include extremely vigorous brushing or flossing. Gum irritation caused by misaligned teeth, ill-fitting crowns, dentures, bridges, and braces, or rough edges of fillings. These may also contribute to plaque deposition and difficulty in plaque removal. Many types of medication have been associated with gingivitis, including contraceptive pills, phenytoin (drug to control seizures), and heavy metals such as bismuth and lead. Hormonal changes during pregnancy and menopause. Immuno-compromised conditions, as in AIDS or cancer. Gingivitis may be the first sign of disease in about 25% of children suffering from leukemia. Habits such as smoking or chewing tobacco. Severe malnutrition and vitamin deficiencies can cause gingivitis. Examples – scurvy (due to vitamin C deficiency) and pellagra (due to niacin deficiency). Gingivitis due to viral infections, such as acute herpetic gingivostomatitis caused by herpes virus. Fungal infections may cause gingivitis by overgrowth of fungi, such as Candida albicans in the mouth, resulting in candidiasis or thrush. Gingivitis may occur in the gums surrounding the crown of an impacted tooth (a tooth that has not fully erupted). This condition, called pericoronitis, occurs more frequently with the wisdom teeth. Less than adequate oral hygiene forms the basis of almost all types of gingivitis, compounded with bacterial invasion. 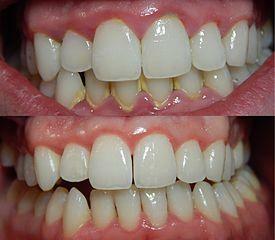 Even after removal by brushing, plaque usually forms again within 24 hours. Plaque build-up can be avoided by brushing and flossing regularly. Plaque remaining on the teeth for more than 2 or 3 days can harden under the gum line and form tartar, which is more difficult to remove. The marginal gingiva is involved in most types of gingivitis, where there is accumulation of microbial plaques. Within 4 to 5 days of plaque accumulation there is an acute inflammatory response which causes an increase in gingival fluid and neutrophils. Fibrin deposition and collagen destruction occurs at this stage. Lymohocytic infiltration occurs in about a week’s time leading to formation of lesions. An increase in monocytes and plasma cells may be noted at this time. Without treatment, the lesions may become chronic. Plasma cells and B lymphocytes will be present at this stage. With further progression of the condition, pockets are formed between the gums and the teeth. These pockets cause separation of the tooth from the gums and may bleed while brushing or flossing. With time, the ligaments and bone supporting the tooth are gradually destroyed. If still left untreated, the tooth will ultimately fall out. In case of ANUG, there is more acute involvement of tissues. Local tissue destruction is more rapid, along with local and systemic spread of infection. ANUG may be caused by organisms such as Prevotella intermedia, alpha-hemolytic Streptococci, Actinomyces species, or different types of oral Spirochetes. Read more on the signs of gingivitis. Do not brush for less than 1 minutes or too vigorously. Flossing and the use of antiseptic mouth rinse is necessary. Consult with a dentist at least once every 6 months for a routine check-up. Dental cleaning procedures (scaling and polishing) should be done regularly. Attend to dental problems as soon as possible. Eat a well balanced diet, especially foods rich in vitamin C.
The first step in the treatment of gingivitis is professional dental cleaning. This is done by a deep-cleaning method called scaling and root planing. The first part of the process, known as scaling, removes the accumulated plaque and tartar from the surface of the teeth. The next part, known as root planing, is done to make the rough edges on the crown and root surfaces smooth so that plaque cannot adhere to them easily. Follow up consultations with a dentist after dental cleaning is necessary to monitor the progress of the treatment. An antiseptic mouth rinse containing chlorhexidine gluconate is usually recommended by the dentist to clear away bacteria. Local factors contributing to difficulty in plaque removal such as misaligned teeth, ill-fitting mouth appliances such as braces, crowns or bridges may need to be taken care of. Treatment of any related illnesses or deficiencies. Antibiotics to eradicate infection in a case of ANUG. Antibiotics are not routinely used for treatment of uncomplicated gingivitis, but may be indicated if dental surgery is planned. Saline rinses and oral rinses with hydrogen peroxide 3% solution may help with early resolution. Analgesics (pain relievers) such as ibuprofen, along with topical anesthetics (used locally on the gums) may be used by patients with ANUG if it has been prescribed by a dentist. Its helps to control pain so that the patient can eat, brush, and floss. Surgery may be necessary in case of extensive damage. Always consult with a dentist before attempting to control gingivitis with home remedies. Regular brushing of the teeth twice a day. If possible, brush after every meal. Using a soft toothbrush with rounded bristles. Rinse the mouth after every meal or snack. Use a plaque-reducing rinse. An electric toothbrush may be able to remove plaque and tartar more effectively. Certain toothpastes, both herbal and non-herbal, are may be effective. Toothpaste containing peppermint oil or sage oil may provide some relief. Food such as mozzarella cheese, fresh fruits and vegetables are said to be tooth-friendly and prevent the build-up of plaque. Rinsing the mouth with saline solution – a glass of warm water with a generous amount of salt added to it – can help to relieve pain and reduce inflammation. Rubbing clove oil on the gum may help to reduce pain and swelling. A bit of clove chewed gently may also be useful.